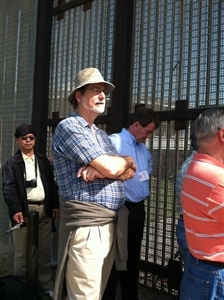 Bishop Ken Carter waits at the U.S.-Mexican border for a Communion service through the gate with visiting bishops on the other side. UMNS photo by Diane Degnan. SAN DIEGO – Florida Conference Bishop Ken Carter was among more than 50 leaders who got a firsthand look this week at the conditions faced by people who live and work near the U.S.-Mexican border as part of the Forum of Active Bishops' meeting. 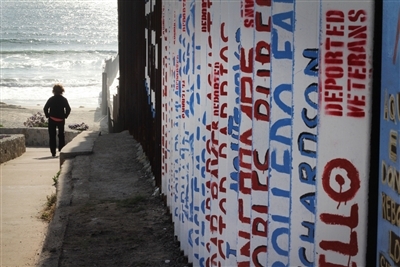 Carter was in a group that hiked 1.5 miles through the Tijuana Estuary, one of the last undeveloped areas in the region that is commonly navigated by immigrants crossing the border into the U.S.
"As we hiked to the border, I imagined the journey of families escaping persecution, searching for a better life, and yearning for reunion with loved ones," Carter said. The experience occurred as the U.S. Senate Judiciary Committee debates the issue of immigration reform. More than 50 bishops from across the U.S., Africa, Asia and Europe attended the forum. On May 7, they divided into four groups, each with different itineraries, to see the reality of life at the border and sharpen their focus on how The United Methodist Church can be in ministry with border residents. A loaf of bread for Communion was divided into quarters, with each group carrying a piece. At the end of the afternoon, the four groups converged at Friendship Park for a Holy Communion service, separated by the border wall – some on the Mexican side and some on American ground. “Consider what it means to live in poverty amidst great wealth,” said Bishop Minerva Carcaño of the Los Angeles Episcopal Area. Rev. John Fanestil said that he began serving Communion in Friendship Park in 2008 to stand in solidarity with families who meet there. Bishop Debra Wallace-Padgett of the Birmingham Episcopal Area walks along the Mexican side of the U.S.-Mexico border fence. UMNS photo by Kathleen Barry. The visit was a learning experience for the bishops, who met with Mario Lopez, a representative of the San Diego mayor’s office, at San Ysidro and viewed the pedestrian bridge leading into Tijuana. At another stop, they met with Enrique Morones, director of the Border Angels, a volunteer nonprofit organization that advocates for human rights and immigration reform through community education and awareness programs. One group of bishops crossed the border into Mexico to the Plaza del Bordo, an open-air migrant encampment to distribute health kits to the community. They also visited a ministry of the Methodist Church of Mexico. “Today was a powerful reminder of the relationship we have with the struggles of migrant people and with strangers all over the world,” said Bishop Warner Brown of the San Francisco Episcopal Area. “The division of families, the division of the church, sisters and brothers here and there, the division of neighborhoods – that was exactly the same." The border visits followed a keynote address from Lt. Gen. James Dubik, a retired Army general who shared lessons in leadership and change management gleaned from a 40-year military career. He is now a consultant for the National Leadership Roundtable on Church Management, where he has used his expertise to help the Catholic Church in the U.S. The bishops also heard from Rev. Dr. Martyn Atkins, general secretary of the Methodist Church in Britain. Atkins said that he was encouraging Methodist leaders to do three things: 1) to tell a new story, talking about who we are becoming; 2) engage in holy risk-taking, believing that holiness and risk belong together; and 3) encourage people who take risks, allow them to fail and still support them. The morning’s worship experience, led by Bishop Patrick Streiff of the Central and Southern Europe Episcopal Area, focused on the theme, “Come walk with us, the journey is long.” He asked participants to center themselves around their calling into ministry. -- Florida Conference Connection edtior Susan Green contributed to this report.